This book is a complete professional-level tutorial and reference to operational amplifier theory and applications. 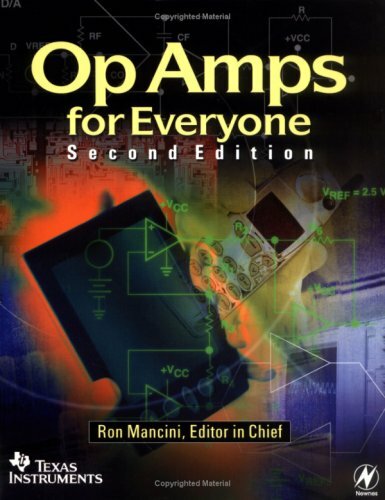 Covered are basics op amp physics (including reviews of current and voltage division, Thevenin's theorem, and transistor models), idealized op amp operation and configuration, feedback theory and methods, single and dual supply operation, understanding op amp parameters, minimizing noise in op amp circuits, and practical applications such as instrumentation amplifiers, signal conditioning, oscillators, active filters, load and level conversions, and analog computing, circuit construction techniques, grounding, input and output isolation, using decoupling capacitors, and frequency characteristics of passive components. From the table of contents: Introduction - Electronics, Voltage, Electric current, Frequency, Direct current, Alternating current; Electrical Components; Basic circuit laws; AC analysis; Basic devices; Digital circuits; and more. This text introduces the most important digital circuits: adders, decoders, multiplexers, D flip-flops, and simple state machines. The textbook puts the ability to understand these circuits into the hands of hobbyists or Computer Science students. Organic electronics, such as displays, photovoltaics and electronics circuits and components, offer several advantages over the conventional inorganic-based electronics because they are inexpensive, flexible, unbreakable, optically transparent, etc.